Today on First Kiss Friday, I’d like to welcome back my dear friend, Jude Knight. 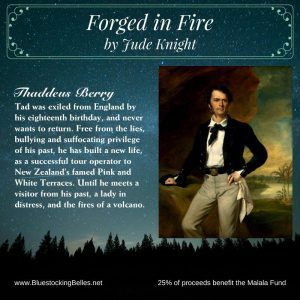 Forged in Fire, Jude Knight’s contribution to the Bluestocking Belles’ anthology Never Too Late, keeps the hero and heroine busy surviving a volcano during their story; their first kiss comes right at the end. 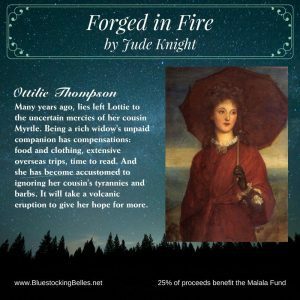 Rather than spoil the impact by sharing it too soon, the following excerpt has the kiss that Tad dropped on Lottie’s hand as they walked back to the tourist town of Rotorua after the eruption. Tad and Lottie returned to Rotorua with a group of Te Wairoa refugees, who had been invited to stay with relatives at the Ohinemutu village. The great pall thrown up by the volcano still darkened the sky, and the walk took the whole day, from just after breakfast. Atame wasn’t with them. He had joined a boat trip across Lake Tarawera to see what had become of the Māori villages around its shores. Lottie had seen enough to know he would find nothing, but assured Tad that, if he wanted to go with his friend, she would be fine. 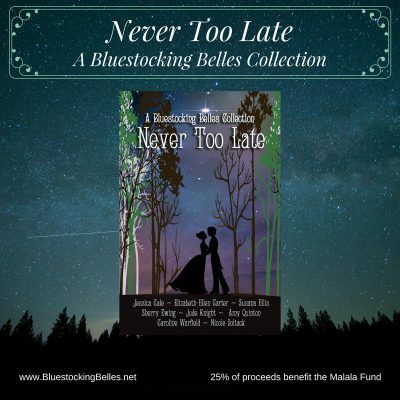 His voice trailed off, and he put out a hand to help her over a fallen tree trunk in their path. On the other side, he didn’t release her hand, instead lifting it to see the scratches and torn nails disclosed by this morning’s wash in the muddy water of a lake they had passed. “They will heal,” she reminded him. He was not, she thought, talking about the volcano. Yes. She had survived her scandal, her grief, her dull and empty life with Myrtle. But he had more than survived. He had thrived in this far land, transcending his undeserved disgrace. They stopped for a bite of lunch on the shores of Tikitapu, where the conversation became more general, though mostly in the lyrical fluid sounds of the Māori language. Tad kept translating bits for her, and occasionally one of the others would address her in English. She was content, she realised. Her various scrapes and bruises hurt, she must stink to high heaven and would seriously consider selling her soul to any devil who offered her a bath, and she was walking through a devastation worse than any she had imagined. But no one had scolded her in two days, she had friendly company even if she did not understand what they said, and the man with her held her hand and looked at her as if he liked her.